Awards have also been given for specific schemes such as the ‘It’s Your Neighbourhood Projects’ of the Village Hall Border and Townend Meadow. 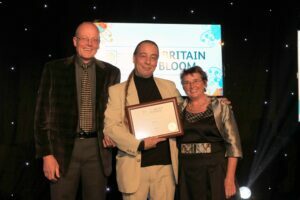 Cartmel also won ‘The Growing For Gold’ award (marking 50 years of the RHS Britain In Bloom) for the special scheme adorning the Village Institute and other buildings In Devonshire Square. 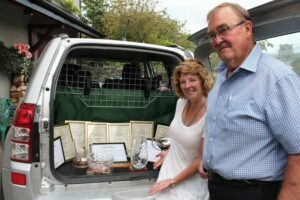 Cartmel’s Primary and Secondary schools often also enter the competition and bring home awards in the ‘School Gardening Certificates’ category. ‘Cartmel is a beautiful village in which to live and visit. 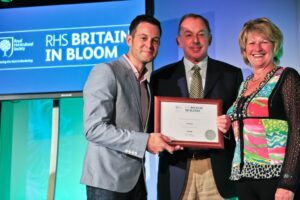 The Bloom Group here are engaging in environmental and floral projects that make a real difference, brightening up and improving the place for all. They have started on the second phase of their journey in their Bloom campaign with strategic plans that they are beginning to realise by engaging their partners. Participation in the campaign is very strong and obvious demonstrating the commitment of those involved all the year through’.